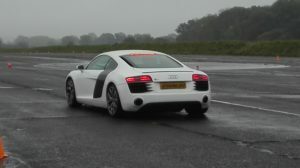 After I drove the Ferrari F360 Modena Challange on an extremely wet track and under heavy rain, when it came time to try the Audi R8, the weather conditions were a little better. 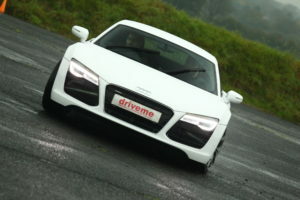 From the beginning I realized that the Audi R8 driving experience would be fun. My co-pilot seemed very comfortable, explaining the features of the car, which certainly has a slower acceleration than the Ferrari but more effective brakes. And as you can see from the photo, my co-pilot was already giving me advices on the trajectory to follow through the curve to better exploit the acceleration of this car and to pass the Mustang GT. I did it perfectly! 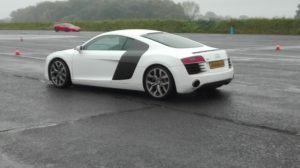 My speed was not very fast, but surely more than a 150 km/h, braking before entering the chicane, sliding the car from right to left to get a good test of the Audi R8 on a wet road. Still down a gear, we tackled the third turn to avoid skidding during acceleration at maximum output, and again accelerating hard until fifth gear. At the start of the third lap, I pushed hard until fifth gear, then downshifted through the chicane and another again before the hairpin; there was a slow car in front of me, a Lamborghini Gallardo, who moved to the right and let me pass. Start the fourth lap, I ran very fast on the straight away, taking advantage of the whole track and slowing before the hairpin. I had the Lamborghini Huracan in front of me and I knew perfectly well that I could not out accelerate it. I tried to get as close as possible while braking for the curve. I explained to my co-pilot that I wanted to try to put the second gear for the hairpin and have more speed through the curve to try to get exit already joining the car ahead. He told me to try but to be careful about accelerating out of trajectory because the track was wetter. I went for it and was pretty much attached to the Huracan through the curve. My foot was already on the accelerator and I started to accelerate much earlier by following a much more aggressive line. 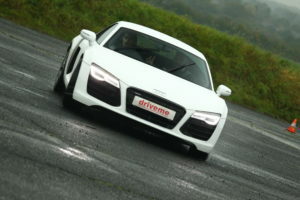 In the second gear, and almost at full throttle the R8 slide a bit. It was a slight overrun that I handled well by taking my foot off the gas for a moment, but that was enough to slow my momentum and all I could do was watch with the Lamborghini Huracan in front of me, with his 610 horses, pull away in a flash. The smile in the picture tells much about the maneuver I was about to pull off. Here I am in curve, in second gear, I already floored the gas and I’m going outside of the Lamborghini Huracan exiting out of it. 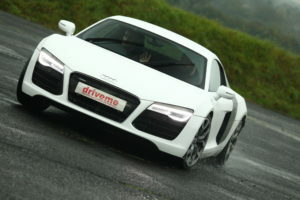 The wet asphalt this time did not betray me and the R8 was perfect in the curve! Once out of it, I could use all the power of the R8 in acceleration, but it was not enough to keep ahead of the Lamborghini, which catch up to me. But while braking for the next turn I had the inside track plus I have studied the braking point of the Huracan pilot and I knew that I could brake later with my R8. I could run the chicane faster and I was already thinking of using that advantage otherwise the Lamborghini will pass me smoothly on the next straight away. The last lap was a breeze; it has almost stopped raining and I had no one in front of me, I could use the whole track, it was a pure fun! Even if it’s not the same with the wet track, but my co-pilot was a blast, he continued to tell me I was doing great and that I did great despite the wet track. 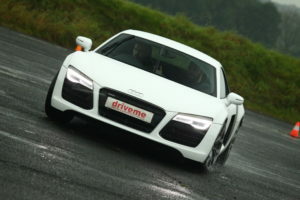 It was a wonderful experience with the R8, even on the wet track. It could have been a lot more fun with dry track, but maybe it’s a good excuse to go back on a sunny day and make a new session with the R8. I would love to test the true potential of this supercar on dry track. Many thanks! You can even subscribe at the bottom of the home page or in the section “Follow Us” to get an email for all the new posts! Many thanks for the nice comment, i love to share my experiences with people that love the same things! 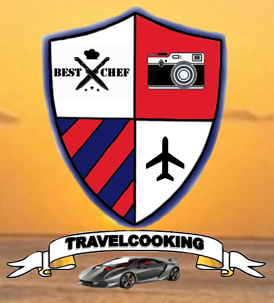 Keep following us and if you have time you can even subscribe on the bottom of the home Page or on the “Follow Us” section. It needs just tour name, email and 30 seconds of your time, to get an email for the new posts… and of course it’s for free! Many thanks for your comment! Keep reading my posts, you can even subscribe on the bottom of the home Page or in the “Follow Us” section to get an email for the new posts!